I got back to St Albans station this evening to a bit of a conundrum. When I went to the bike racks to collect my bike I find that there are two D locks connecting it to the frame, rather than the one I attached in the morning. After spending a couple of minutes in "WTF??!?!?" mode I went back to speak to the station staff. I explained myself to the guy at the ticket office and he recommended that I speak to the supervisor over at the information desk on platform one. After explaining the situation he asks "Do you have any proof of ownership?". This was a bit of a problem. I don't tend to carry that sort of thing with me (and I imagine no-one else does either). I can open one of the locks attached to my bike, but not the other, so that doesn't help much. Fortunately I have my passport in my bag and the guy is willing to take a copy of that along with a written statement of consent as sufficient excuse to get the bolt cutters out. He finds cover for the information office and we head over to the bike racks. Of course the bolt cutters would have been up to the task if it had been a chain or cable lock. Not for a D lock though. After about 10-15 of fruitless effort we managed to get through the rubber sheath on the lock. 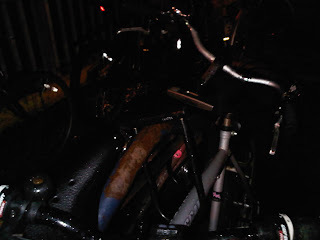 My main concern was that someone had put the lock on hoping that I would go home and leave the bike locked there; leaving them free to come back in the early hours of the morning and nick it. This thought didn't leave me with a good feeling about giving up on cutting the lock, even though it seemed pointless. As we were struggling away a guy comes up to collect his bike which is locked up near mine (not on the same rail). He realises that his bike isn't locked up. Somehow he managed to put his bike in the rack and then put his lock onto a completely different bike. Mine. There were embarrassed apologies and statements of relief then we all went our separate ways. I have come away with increased respect for the staff at St Albans station. Everyone there was very polite and helpful. Much kudos.